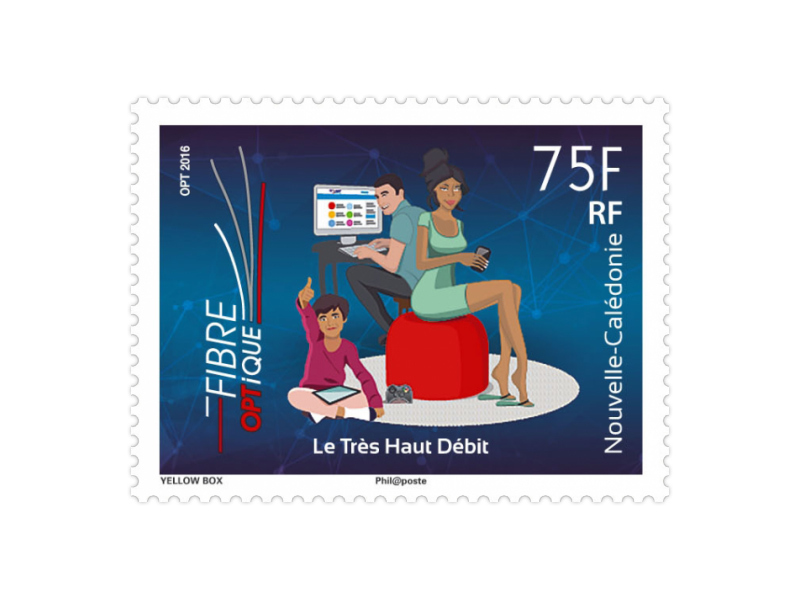 The new 75 XPF stamp issue to be revealed at the 16th Stamp Collectors Fair in Noumea Townhall showcases the cutting-edge fibre optic technology which will provide New Caledonian users with speed-of-light voice telephony and internet access. The public presentation of fibre optics and the fibre optic cable rollout plan was held in October 2015 to mark the switch-on of Kaméré, the first district in Noumea to benefit from superfast fibre optic internet access. Since then, the rollout of fibre optic lines and connection of homes and businesses has continued apace, with the OPT committed to extending the superfast broadband network to all its 70,000 landline customers by the end of 2022. As a result, a portion of eligible customers in twenty areas ranging from the Noumea districts of Kaméré and Portes de Fer to Bourail and Koné, including Greater Noumea and the Loyalty Islands are already enjoying the benefits of superfast internet access. Fibre optic cables are the best means of bringing superfast voice telephony and internet access to each home and of paving the way for the introduction of new services. Customers get a whole bundle of benefits all along the line (superfast speeds, signal stability, symmetrical connection) over far greater distances than standard broadband. Unreservedly modern and future-focussed, this stamp illustrates the link between traditional mail and the innovative technologies developed by OPT. The visual design reflects the graphics used in all communications relating to the SFBB fibre project. With SFBB, OPT-NC is helping to promote equal opportunities, enhance New Caledonia’s image and make businesses more competitive. Superfast broadband will play a key role in putting New Caledonia on the map in terms of e-health, e-education and e-learning... That’s surely worth a new stamp!